Minister please accept this petition to show you the global awareness this issue has. Over 10,000 people signed this petition in a very short time. I could have run it to 100,00 but this needs to change right now . 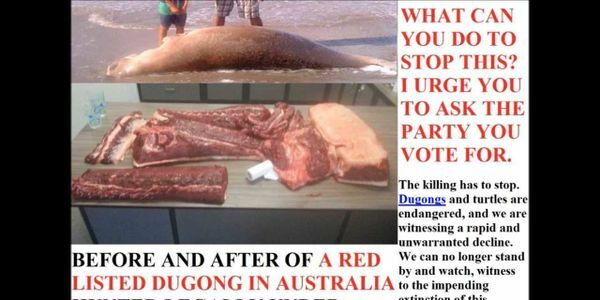 We condem so many other countries, yet allow unmonitored uncontrolled hunting of red listed vulnerable Dugongs and vulnerable Green Sea turtles . The native title act is now nearly 21 years old. And needs an urgent change to delete the right to exclude the hunting of endangered and vulnerable marine and animal life in Australia. Yours sincerley Colin Riddell petition creator. Due to the slow action IF ANY on Banning hunting in GreenZones /Marine parks. AND NO SIGN of the TWO YEAR MINIMUM Moratotium (within six months of taking office) by the newly elected Government. We will keep this going until they do as promised. We handed it in to the Minister at 11,000 BUT LETS KEEP IT ROLLING TO show the nation and WORLD wide disgust, that this is legal in Aistralia. Hi everyone we achieved 11,000 signitures and I thank you all. The petition will be presented next wednesday personally to the Environment minister by an indigenous supporter. Many many thanks you all did something to help. Kind regards Colin Riddell.